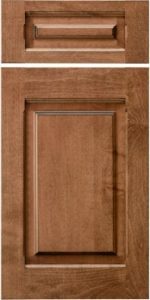 The CRP-10141 is somewhat similar to the CRP-10RC446, except that this door uses a Chamfer profile framing bead on the stiles and an Ogee profile framing bead on the top and bottom rails. It is truly a designer-oriented door that is fashioned after high-end furniture rather than cabinetry. 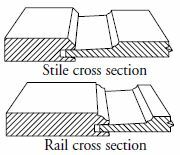 The cross-sections below are an example of how your door will look, but any profiles you choose will determine the final look of your door. None - Design specific, no options. (Ogee bead on rails with chamfered stiles), no options.